She works cheap she works for food! I like spiders thatwork on the ground not where I can get bit by them! Toads are my best friends! I hate spiders, but the web she makes, and her size and coloring are too pretty for me to disturb her. It really is quite amazing that there is a whole world of other organisms living in the garden, not just the plants for mah belly!! Throw her a grass hopper or a cricket and watch her go to work on it! My dog went right threw this web just the day before and the next morning it was back up like it had never been torn down. Awww... I wish I had one! But the tiny preying mantises that I watched hatch out are now gigantic! Had one of those on my screen for almost a month last year. Scary as heck (I hate spiders) but they are completely harmless. Francis Barnswallow wrote: Had one of those on my screen for almost a month last year. Scary as heck (I hate spiders) but they are completely harmless. Unless your a cricket! this one sure likes potato bugs! I know there good for the garden but its just to scary! I perfer alll the lizards and geckos we have over spiders. 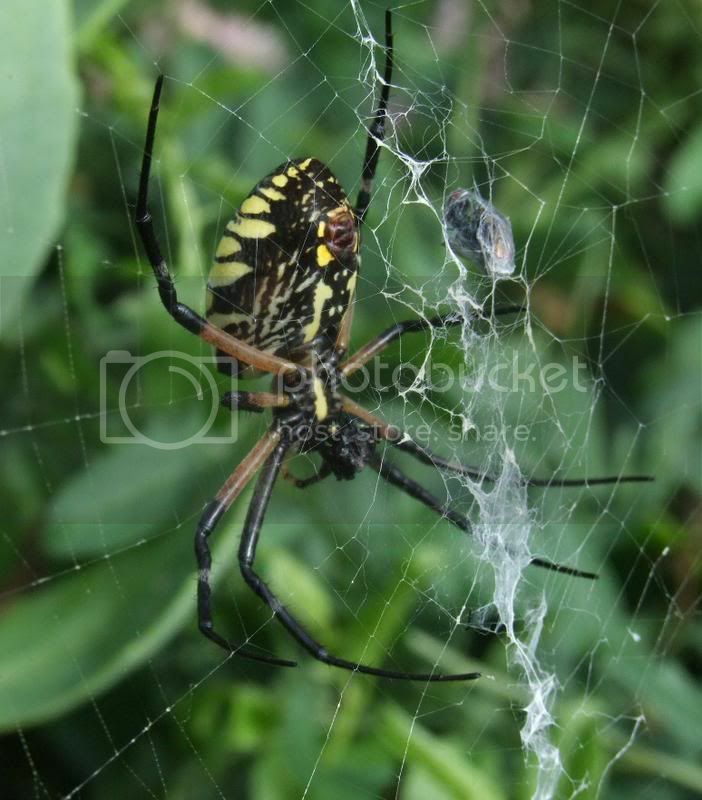 That's a Golden Orb spider, they are very common in this area. I have a couple of huge ones around my house this year. MaryDel wrote: That's a Golden Orb spider, they are very common in this area. I have a couple of huge ones around my house this year. 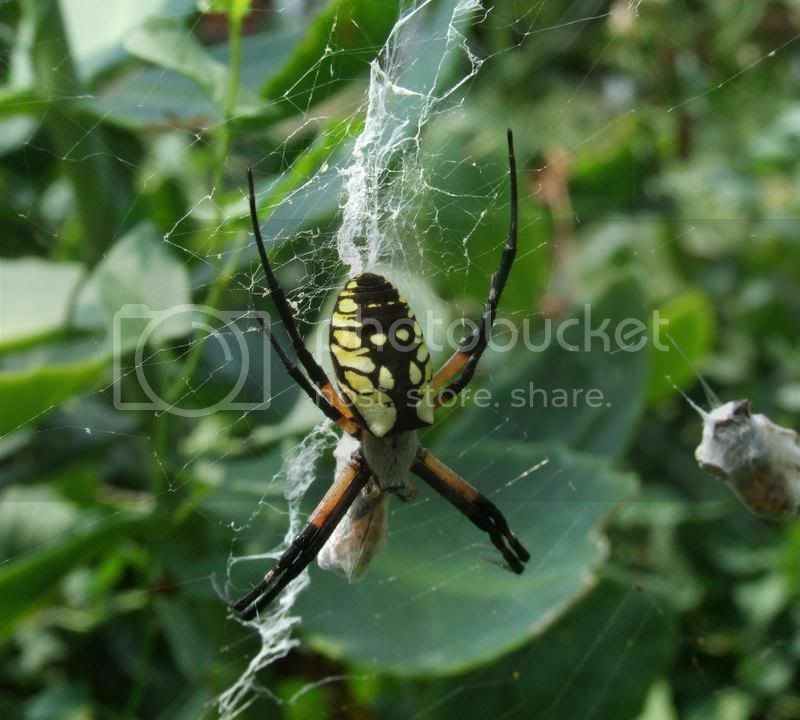 Unless that's just a different name, that's definitely an Argiope. They fight those suckers in Japan. (the females anyway) I know they're harmless, but I'm not gonna be the one to touch it. I have 2 huge ones in my garden as well. I'm content to let them be. They stay out of my way, I stay out of theirs. I do however throw a grasshopper in the web if I get a chance. They LOVE those. Got the clay plot garden in last night!